On Thursday February 25th at 3 p.m. Eastern Time, MIT CoLab (@MITCoLab) and Emerald Cities Collaborative (@EmeraldCities) will co-host a Twitter chat (#citychat) on local advocacy and community-building efforts around climate mitigation and clean energy. This conversation is the first in a series of four Twitter chats that will address equity, economy and climate resilience in low-income communities of color. Our Power Campaign Communities United for a Just Transition. Photo Credit:Flickr/Peg Hunter. 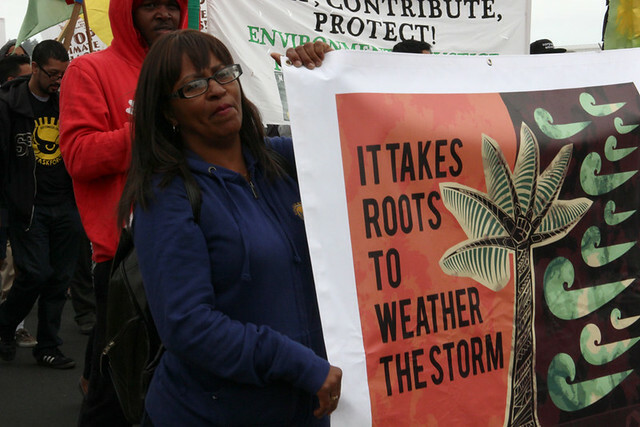 For decades, low-income communities and communities of color have been articulating the disproportionate burden they bear from environmental dumping, climate change and their impacts. They’ve also been cultivating meaningful solutions, having connected the dots among climate, racial, social and economic justice. They understand the importance of climate resilience in the face of extreme weather events and of concrete steps to both mitigate and adapt to climate change. The Supreme Court’s recent decision to halt implementation of the CPP pending a June appeals court review of the regulations increases the urgency to ensure that low-income communities and communities of color participate equitably in the expanding clean-energy economy. What are the broad benefits of clean energy and climate mitigation for marginalized communities? What examples exist of low-income communities ensuring that the environmental, health and economic benefits of clean energy reach their communities? What challenges are these examples up against? How can we effectively engage low income, communities of color in the clean power plan and other climate resilience efforts? What barriers could thwart equity in the clean-energy sphere? Subsequent chats will discuss the role of anchor institutions in climate change mitigation; the role of social and community capital in climate adaptation; and the role of housing/community and economic infrastructure in climate adaptation. The best opportunity to mitigate climate change is to decrease greenhouse gas emissions; and the global clean-energy revolution has great potential to address long-standing community environmental, economic and social issues – or to disregard and aggravate them. The challenge is how to ensure that minority and low-income neighborhoods that disproportionally bear the burdens related to ecological degradation share the benefits of carbon reduction. It is possible for neighborhood sources of pollution to remain in place even as states meet their overall statewide goals, leaving low-income folks and people of color behind in “energy ghettos” that lack access to clean and affordable energy. This #citychat hosted by MIT CoLab and Washington, DC-based Emerald Cities Collaborative (ECC) invites you to explore these pressing issues and share your ideas and experiences related to the environmental, economic and equity benefits –and challenges – of the looming transition to clean energy. Please join this important discussion with our panel of clean-energy and environmental justice advocates, including: Pamela Rivera, Voces partnership and constituency advocate; Denise Fairchild, Emerald Cities Collaborative president and CEO; and Sydney Fang, communications associate of the Asian Pacific Environmental Network. It’s easy to join the Twitter chat. Just follow #citychat on Twitter from 3 p.m. to 4 p.m. EST on Thursday February 25th. Even if you don’t have a Twitter account, you can watch the conversation unfold here. Update: Read the transcript of the chat here.